HBM stands for here be monsters. 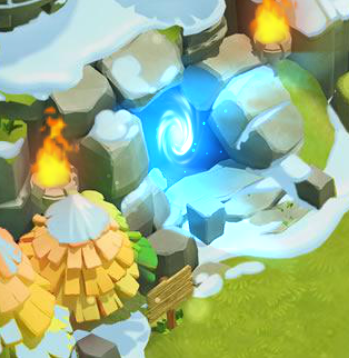 Its the blue portal at the top left of your screen. From there, you can select a wave difficulty you have unlocked. Then, you can start it. 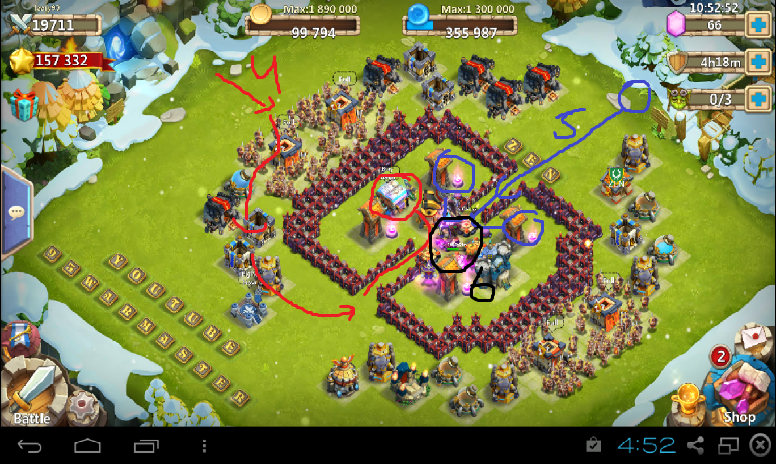 waves will contain 5 heroes and a number of troops and they will try to break your base. 2. How to build a base that is good for here be monsters? 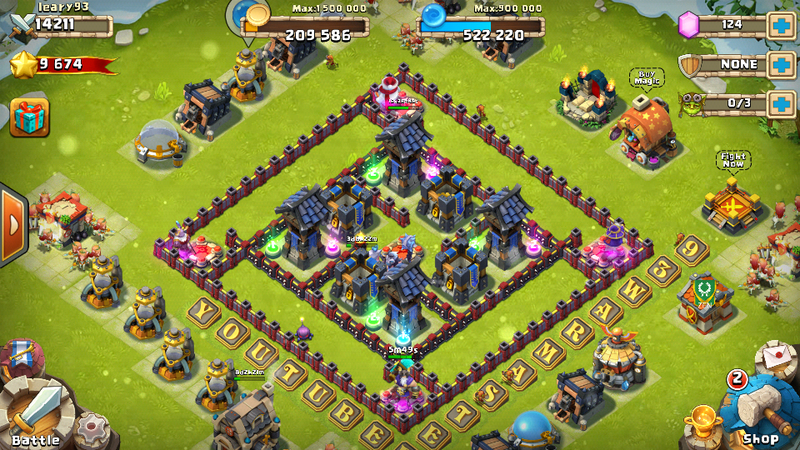 You can build your own base of course, but you can also copy someones else his base. 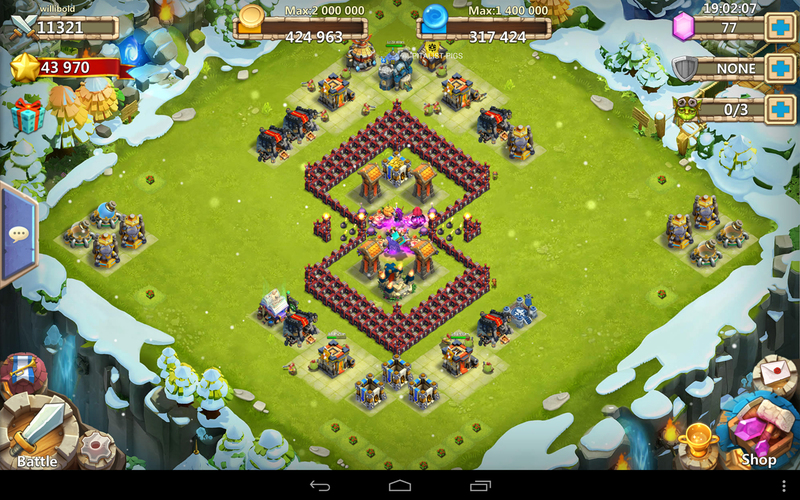 moment are designed by me, but most copy and adjust the basic HBM bases. 2.1 What to look for when designing a base on your own? not try to protect your gold. by pieces, because just 1 tower and 1 hero won't stop a wave. Standing together is standing strong. centric base. A hybrid can Exist too. Even if you have a tower centric defense, don't let your heroes die too fast. as last, or as almost last. by a hero, he will change his priority target to the hero. time to kill of the waves. normal units, and to give our defenses the time to fire on the monsters. 2.2 What to look for if I want to copy a base? stick to it. Mostly because its the most famous one around. the only non-corner design that stands out in the top HBM leaderboard. abuses pathing the most as possible. Second of all, when copying a base, start of with an EXACT copy of a base in that category already existing. but finding a good adjustment becomes harder, the bigger the adjustment is. 2. Don't accidently expose your heroes, or something else that was being protected at first. 3. 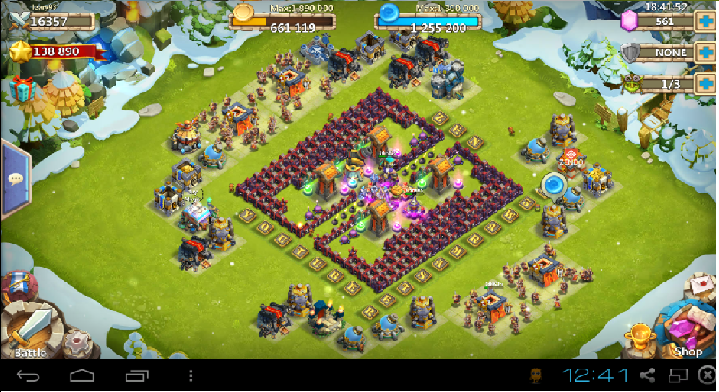 Which troops, heroes, and towers should I use? I'm putting this first, because there is only 1 answer on this question: Guardians. might be the only reason you want griffins. troops with only 1 shot. way more stuns and being able to stunlock a wave. the rest of your heroes more time to attack the incoming heroes, which are more dangerous. Besides AoE heroes, you want an hero that keeps your team alive or enhances your team, that is druid. I would recommend getting druid as fast as possible because he excels in every part of the game. If you don't havedruid, you aren't able to farm as high as when you would've had him. good hero to fit this roll but actually belongs to another category. gives a lot of time, especially when they stun the dino. each level will increase the stationed hero's attack and hp by 2%, you'll gain a significant boost from this. A level 100 hero on a lvl 20 hero base for example will have the att and hp of a lvl 140 hero. are 1800 for druid and 2200 for Thunder God. They have priority above getting your garrisons. extremely important for farming higher waves. Then, getting a lvl 2 green garrison costs 250 shards extra. you will need to level your angel to lvl 50 and the 250 shards go to slimes for lvling her skill to 3/9. tower, so that is a huge investment. their skill up without worrying about wasting shards. twice the experience the wave before that offers, but more shards and gold/mana output. more garrisons, because farming without garrisons is often more beneficial than with garrisons. 4. This is the third line of pathing. 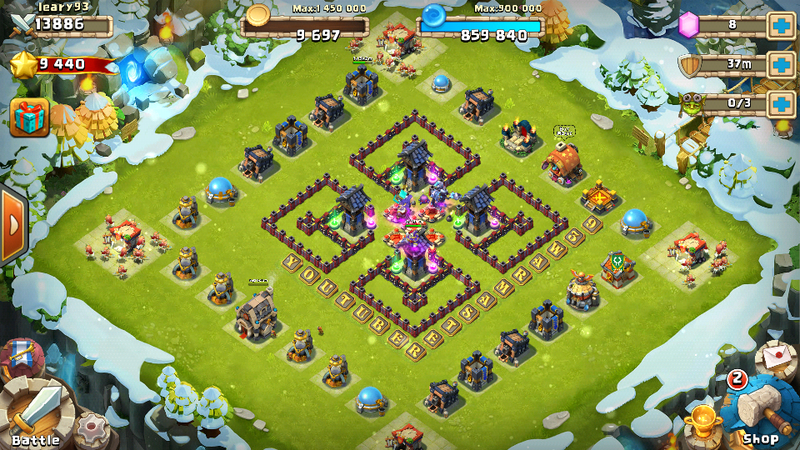 When the waves come directly form the sides of the base, they will target one of my two HP buildings, meaning that they won't target a tower. However, they will still walk all the way around, which again is abusing the pathing AI. 5. Last line of pathing, when they spawn right in front of the entrance. Normally this would be a bad event, but since the towers are equally spaced the wave is most likely to split up and attack two different towers. This makes even a bad spawn endurable. 6. 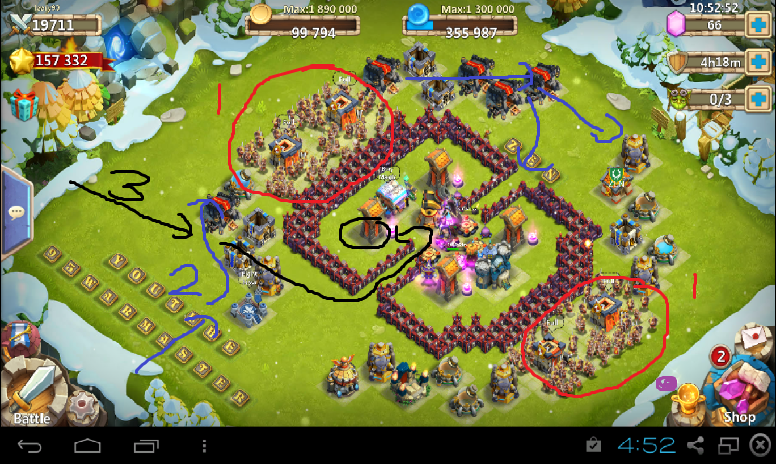 My heroes are stationed all in the middle of 5 towers and 2 high hp buildings, meaning they a. Wont be targeted to quick, b. I have centered all my aggro and c. Im exploiting the strongest part of my defense, my heroes, because they always attack when the waves path in and they gain quite a lot of time for this. what level town hall do you recommend a player has before attempting anything beyond wave B? Whenever you get your 5th hero base and have high enough lvl heroes. Can't chew everything for you, moreover, I havent been in that stage of the game when hbm came. You put in a lot of work, thanks for that. Most detailed guide yet. I think what would be helpful is the TH levels you need to build these designs. Also tower levels and hero levels. E.g. 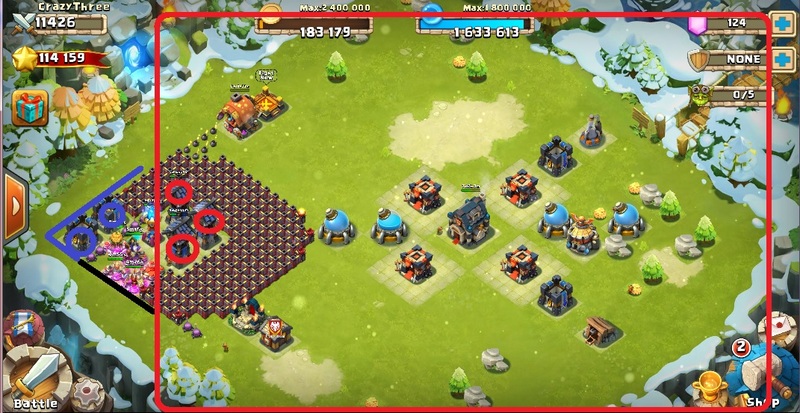 to do XXXX base setup you need min level 50 heroes and 130 walls with Tower level 4 so the mininum range can cover your base. something like that would be great. Thanks so much, this guide is excellent. I have ~3000 might and have not been able to beat B. I switched my defense to box of death and have now beaten B 4/4 tries. I have a question about the troop choice. My army bases are level 1, so I can hire 20 guardians. Even when wave B-2 spawns and heads straight for the base, these guardians do nothing. They all die quickly and do next to no damage. I switched to hunters on my last run and they seemed to do slightly better, though still got wiped quickly. My guess is that either there is a minimum number of guardians needed to be effective and below this minimum the troop type doesn't much matter, or something about the nature of B vs. higher levels makes the guardians not as effective. There are lots of ranged heroes in B like marksman and frost witch, so that might be different than higher levels. Any thoughts you could share are appreciated.